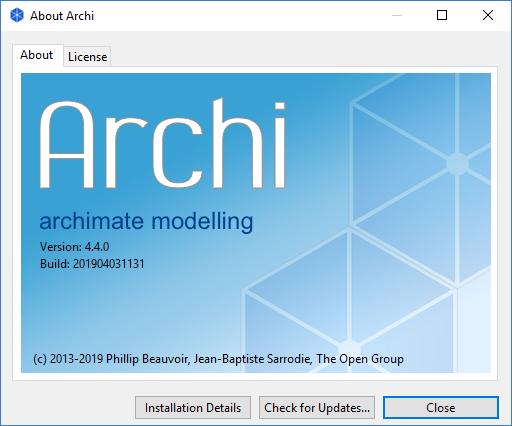 Archi version 4.4 is now available to download. This release contains many fixes, tweaks and quality of life improvements. Many Archi users will be glad to know that we no longer bundle Oracle’s Java Runtime with the Windows and Mac installers. We are now bundling OpenJDK 8 (https://adoptopenjdk.net/) with these installers, which means that you don’t have to be concerned with Oracle’s licensing issues. Also, the Windows installer now gives you the option of installing the Java Runtime. So if you already have Java installed you can choose not to install Archi’s bundled version and use your own. (Note, though, that Archi does not yet run on Java 11 or 12 – coming later this year). There are many more features and fixes in Archi 4.4. You can read the full list in the “What’s New In Archi” document. Is there an update from 4.3 or do I have to uninstall and reinstall ? Will I lose my settings? You can just re-install over the old one. No you won’t lose your settings. Yes, proxy will mean you can’t check for new version.